One of the fun things I like to do with my paper crafting is make different textures for little houses. 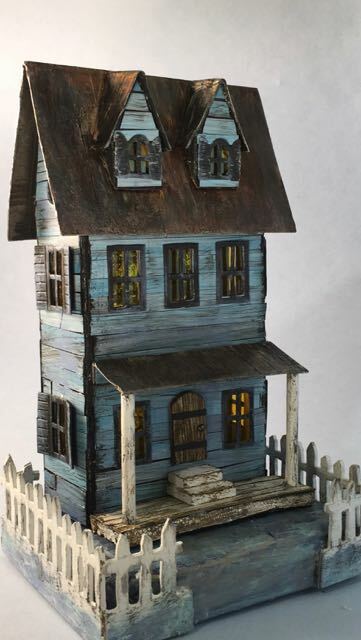 And one of my favorite roofs is a rusted roof especially for the Halloween houses. Why do I like it so much? 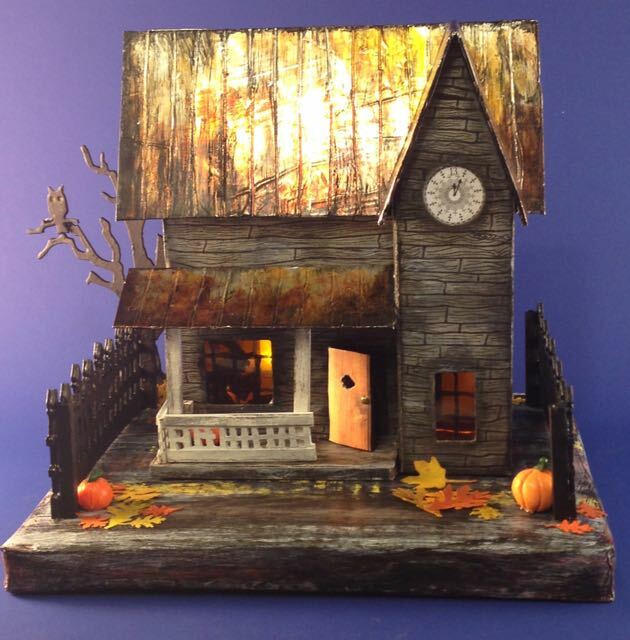 Because it looks very cool and somewhat spooky AND it’s so easy to do. I’ve written about this technique in the past – just updating here with more examples. This is the first house I made using this technique. I love the patina the rusted roof adds to the house. A very popular house is the Sea Worn Beach house. The rusted roof adds a lot to the appeal of the house. Be sure to buy the correct aluminum tape. This aluminum tape is used to seal duct work for heating and air conditioning, but it is NOT the more commonly found stretchy DUCK tape. It is real true aluminum tape with adhesive on the back. I found mine at at a home improvement store. Get the kind that does not have writing on it, sometimes you find it with the brand name written on the tape itself. You don’t want that. Could you use regular aluminum foil? I haven’t tried that. It might work, but I suspect it is too flexible and wrinkly. 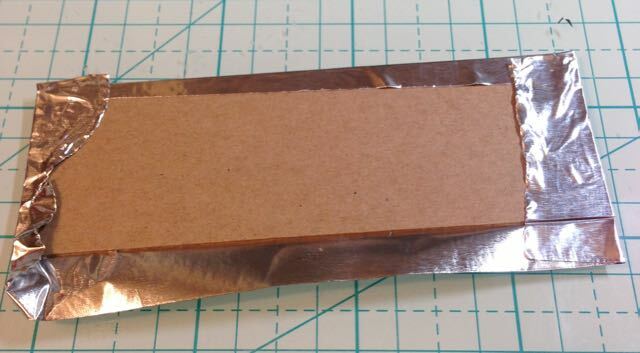 Cut your cardboard in the shape and size you need for the roof of your little house. Test fit it on your house so you know that the overhangs are the correct size. Tear off a section of tape large enough to cover the entire roof and fold over on the edges of your roof. Peel off the adhesive backing and adhere. Be careful when you tape the aluminum tape to the cardboard. It can cut you and you will bleed. 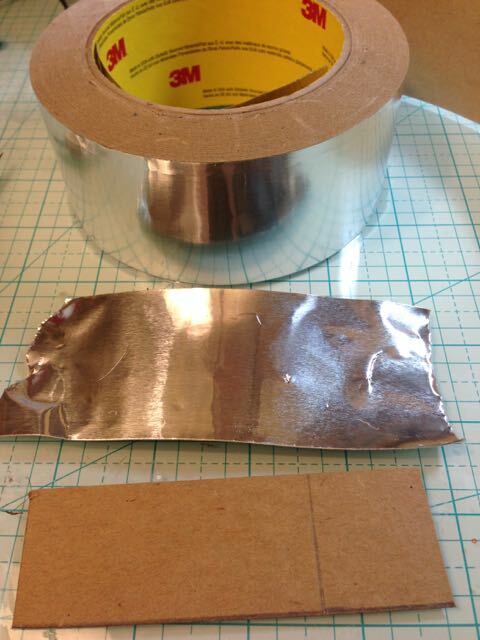 When you are smoothing down the aluminum tape, be careful of the sharp edges. They will cut you. 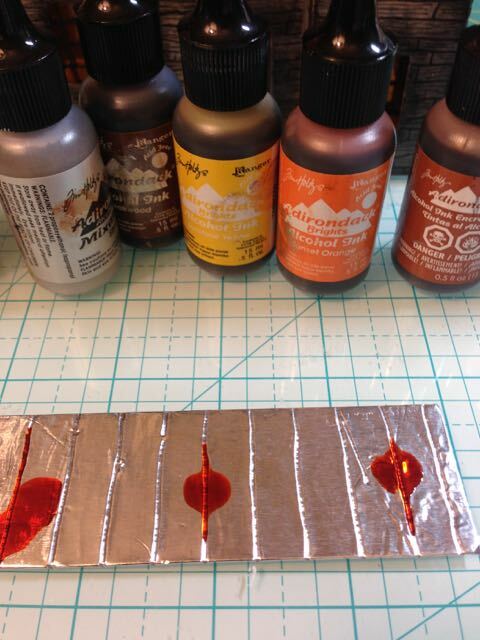 Then some of the rust on the surface will be colored from your own blood instead of from the alcohol inks. Use a dull pencil or a stylus and your ruler to score some parallel lines on your roof to look like the ribs you see on metal roofs. It’s ok if they are perfectly straight. 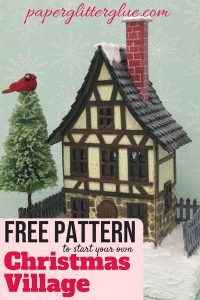 Now for the fun and messy part – coloring your roof. Sometimes to make the roof look really old I smear texture paste on the surface of the tape, but not always. You choose how old you want the roof to be. 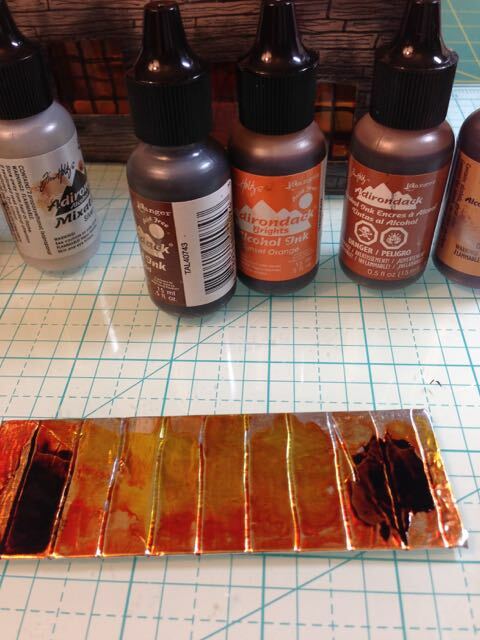 Alcohol inks used for making the rusted tin roof. 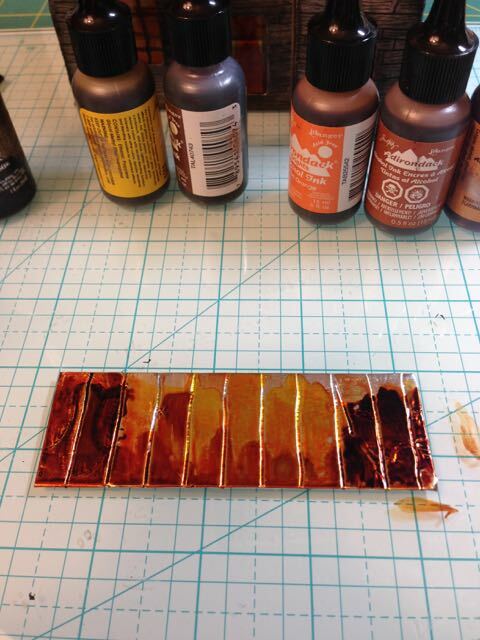 Add successive layers of alcohol inks. Just play around with the colors starting with the lighter colors. 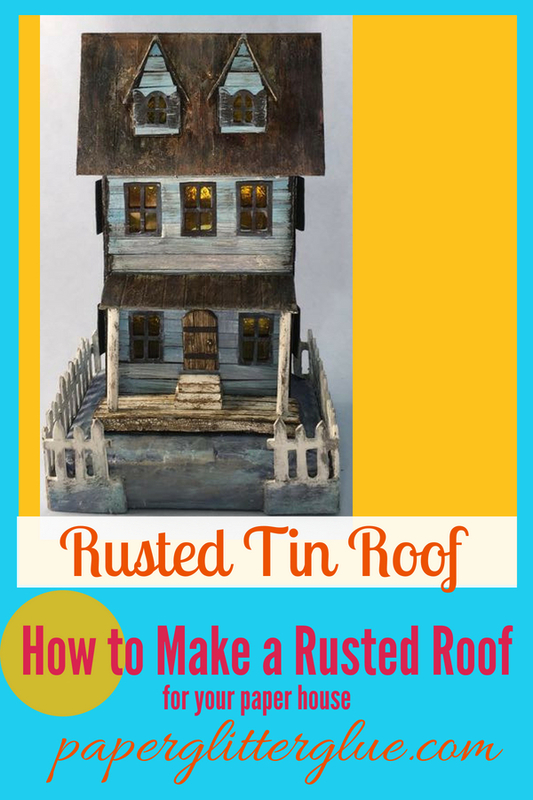 You can’t mess it up – it’s a rusted roof. 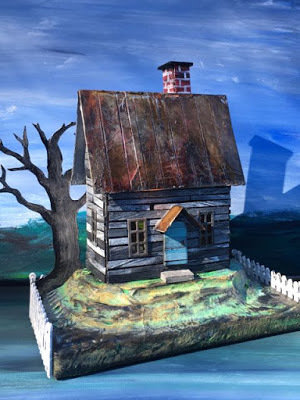 I tend to make the edges darker because that is what I see on old abandoned barns and sheds around here. Lighter colors first on your aluminum tape. I find I have more control smearing the alcohol ink colors around with my fingers. But I don’t mind getting messy. First layer of alcohol ink dried. 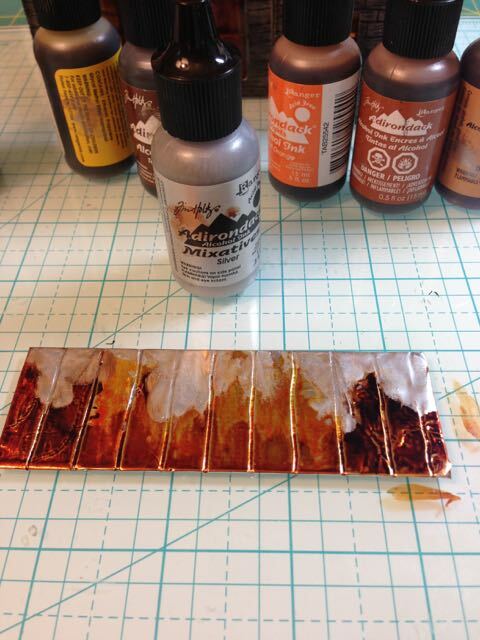 You can add successive layers before drying because the mixing looks great for a rusted roof. Add darker colors to your rusted roof. 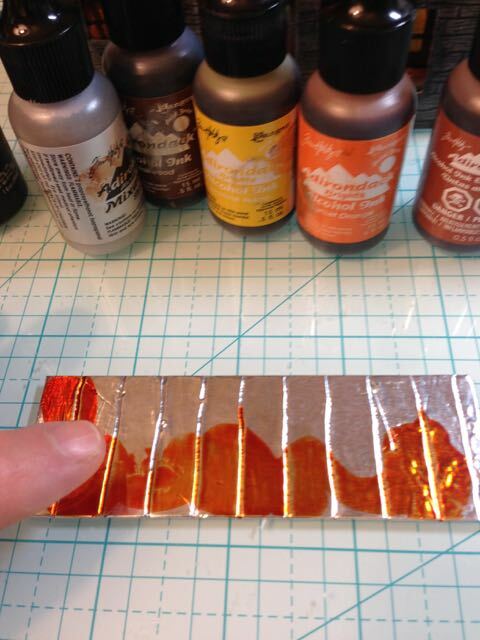 The silver alcohol ink mixative adds a nice dimension to the surface. It dulls it in spots and helps the previous colors mix a little bit. More colors added on top of the silver mixative. Remember to color or paint the underside of the roof that will show on the overhangs. You don’t want bright shiny aluminum on the underside when you’ve worked hard to age the top side so convincingly. 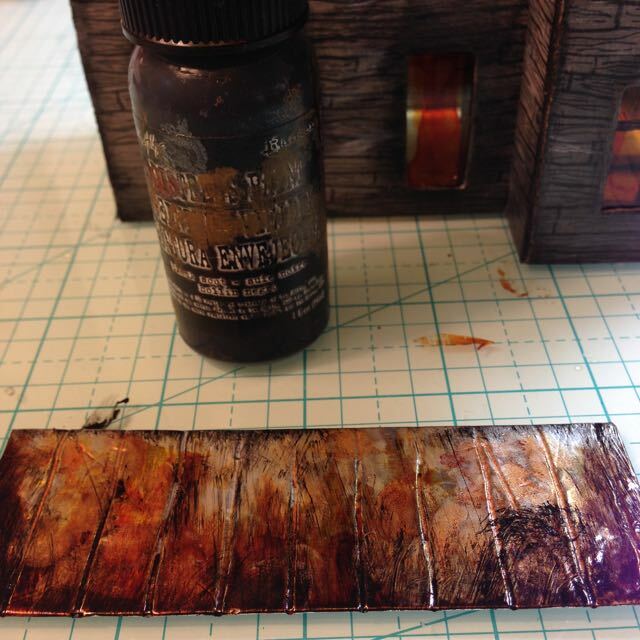 After the alcohol ink dries, I distress the roof more with Black Soot Distress Paint. You can use black paint or gesso if that is what you have on hand. 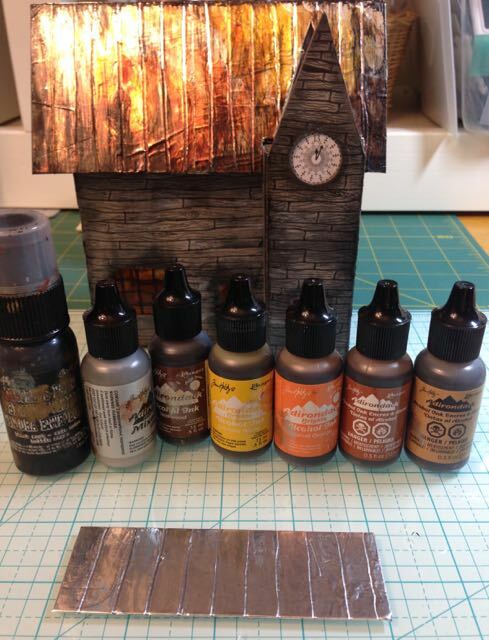 Now distress your roof with black paint to give it even more age and patina. 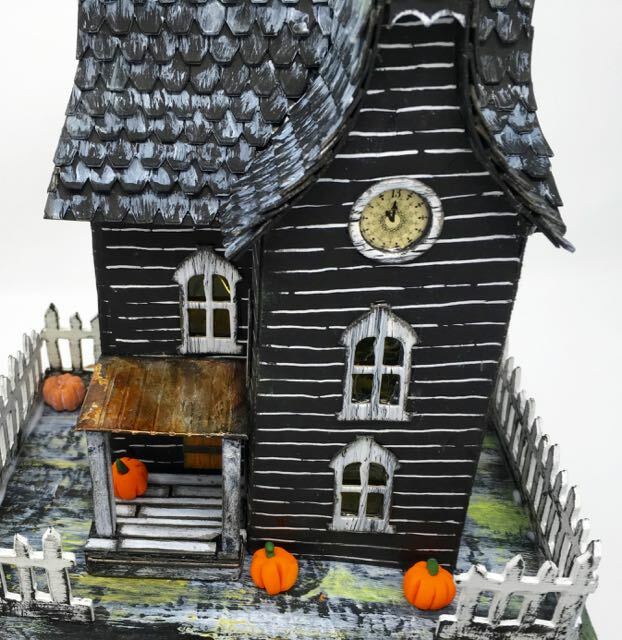 Glue your customized, spooky old roof to your little house. Now admire your handiwork. 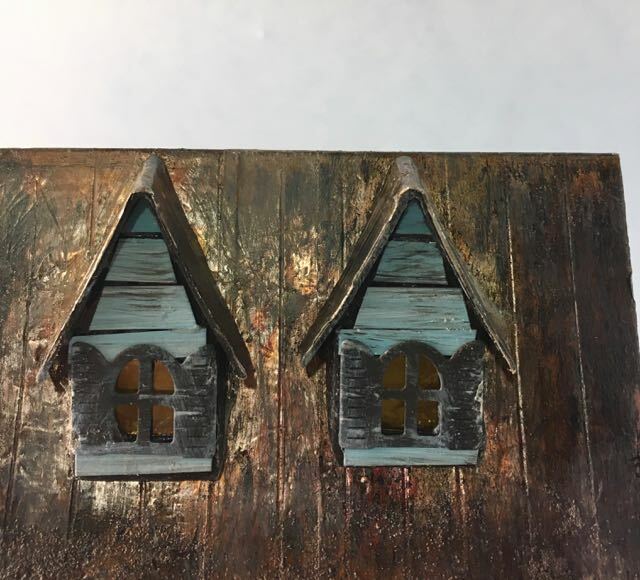 I like this method so much because it doesn’t require a lot of materials, it’s really quick and so effective for giving an aged patina to your project. 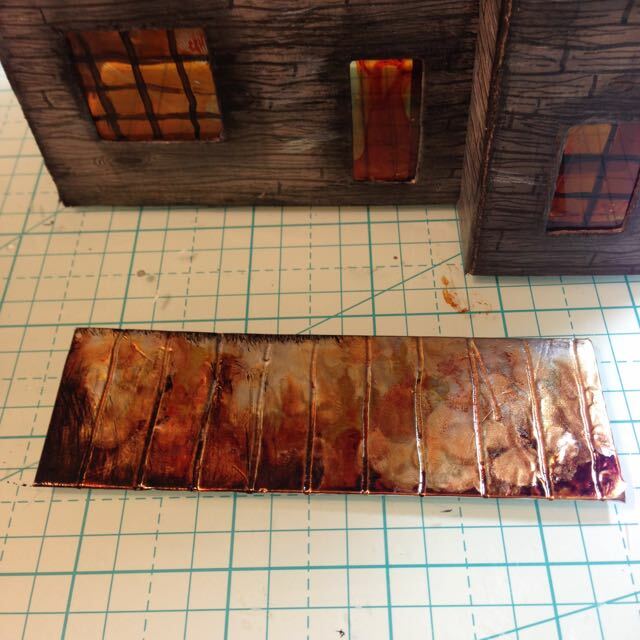 You can also make a rusted roof with specialized rust pastes which are very effective as well. 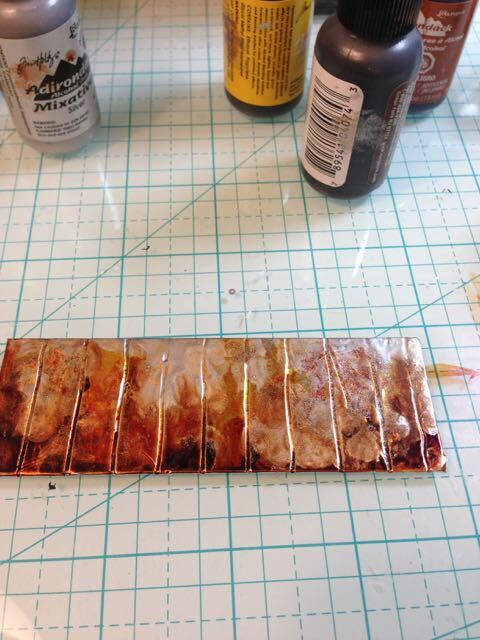 But the alcohol inks are work nicely for making a rust look without purchasing a specialized paste. 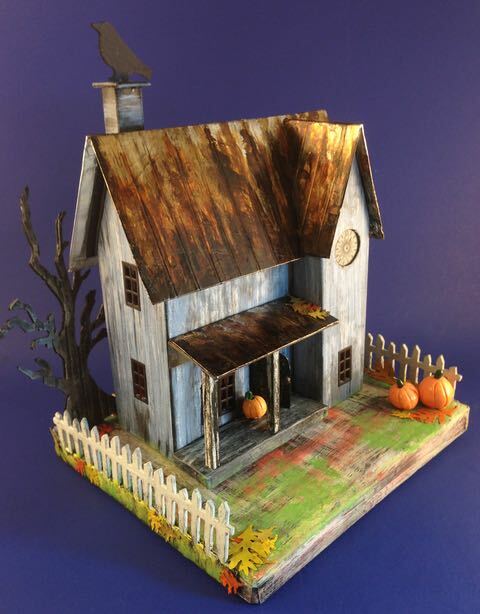 And here is my most recent house with a rusted roof porch – Davenport Hall. View which shows the rusted tin porch roof. 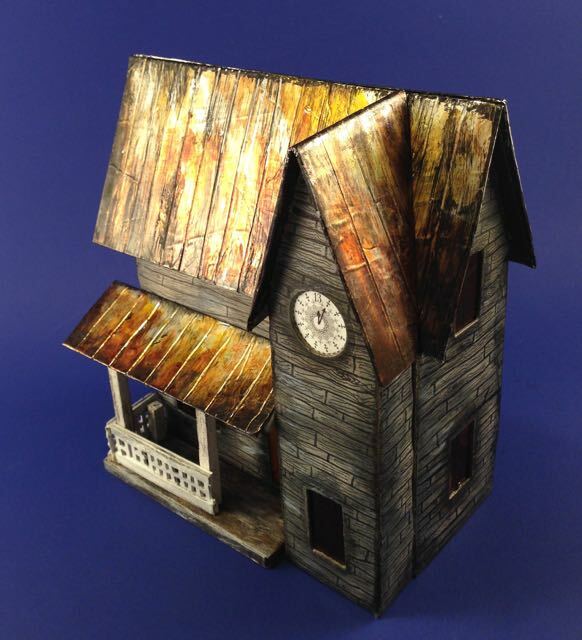 The design overall is so dark, I added a rusted roof for some color variation. What rusted projects have you done? 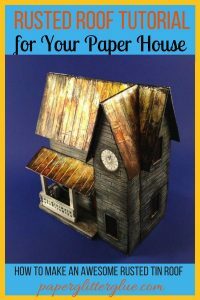 If you make a paper house or a little cardboard house that needs some aging, try a rusted tin roof to add instant age and detail to your house or paper project. 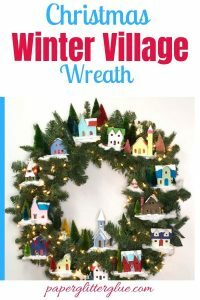 Thank you so much for this post, lots of tips and easy to follow along. 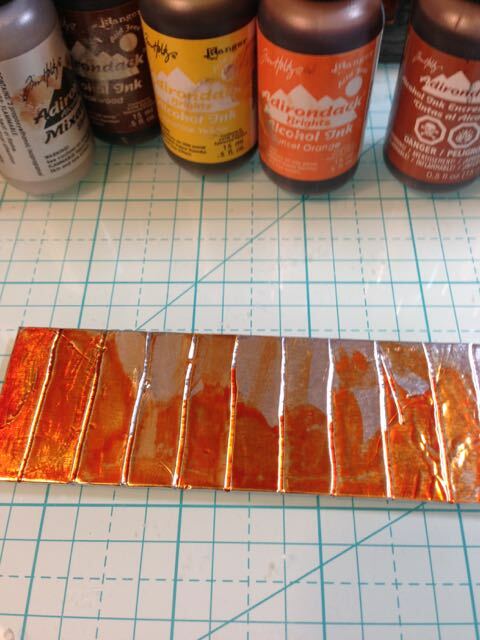 Best part is I already have the metal foil tape that I purchased for another project and get to use up more of the roll. In love with your Sea Worn Beach house! That roof is INCREDIBLE as is the entire house! 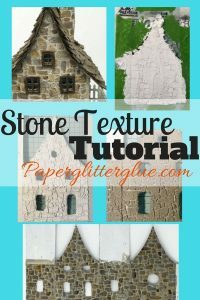 Thank you for sharing your wonderful tutorial! Pinned!